With international tourism arrivals up 11.2 per cent in the first three quarters of 2018, Ras Al Khaimah is on the right track to capitalise on the global adventure tourism industry through the introduction of new and innovative products with both local and international appeal. 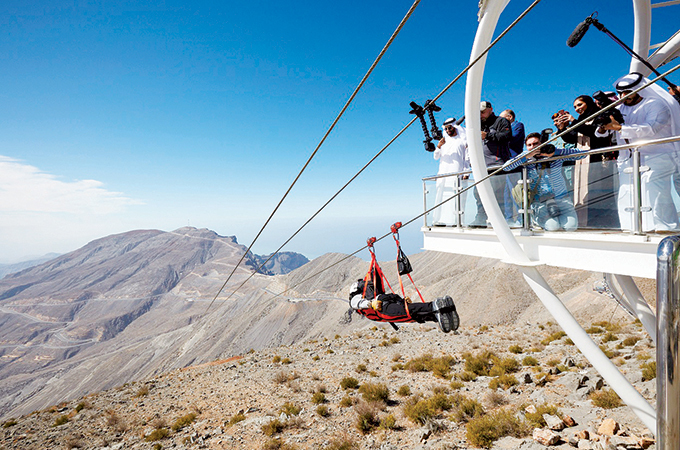 The year 2019 will see the emirate further consolidate its position in the adventure travel segment: construction is in progress on a new ride featuring seven smaller ziplines, slated for opening in the second quarter, new hiking trails will be opened in Jebel Jais, and adventure tour operator Adventurati is all set to offer cycling and canyoning in Wadi Showka. The zipline will celebrate its first-year anniversary, celebrating 25,000 riders in one year of operations. The emirate is all set to host the 13th edition of the much-anticipated “Ras Al Khaimah Half Marathon” at Al Marjan Island on February 8, 2019. Professional athletes, running enthusiasts and amateurs will be gathering in Ras Al Khaimah to take part in the world’s fastest half marathon and experience the brand-new running route surrounded by scenic views. Tough Mudder, taking place next month from March 1 to 2, will test participants with brand-new obstacles and thick mud on a course at the stunning Mina Al Arab Island. With more obstacles, more innovation and more mud-soaked mayhem than ever before, new event formats to the GCC, and a next-level Mudder Village afterparty. The following categories are going to be available for adrenaline-enthusiasts; including Tough Mudder 5K (a 5k challenge with 13+ obstacles); Tough Mudder Classic (a 10k+ challenge with 25+ obstacles); Tougher Mudder (a competitive Tough Mudder race taking place on the Tough Mudder Classic course, but with prizes for the fastest times logged). For adventure-loving children, Mini Mudder will be created for 7- to 13-year-olds that run up to 1.6km long course. UAE Tour (the RAK stage will be on March 1 and includes Jebel Jais for the first time. They will also open it to amateur cyclists to try out the same course as the pros). After five successful years as the Dubai Tour and the Abu Dhabi Tour, the combined and the inaugural edition of the UAE Tour will cover all seven emirates as the only tour race in the Middle East. Starting February 25, the seven-day event will kick off in Abu Dhabi and ultimately roll into Jebel Jais, Ras Al Khaimah on March 1, with the final stage seeing a return in Dubai on March 2, 2019. New features are packed into the mountain stage, called the Ras Al Khiamah Properties Stage covering a distance of 180 km through Ajman, Umm Al Quwwain, Al Marjan Island, and finally concluding with an uphill finish of Jebel Jais as two stages are dedicated to climbers. Via Ferrata is back for a new season of adrenaline-packed experiences. Ras Al Khaimah’s unique adventure attraction, Jebel Jais via Ferrata (Iron Path), has reopened on November 15, welcoming visitors to experience world-class rock climbing and trekking almost 120 meters above ground.